Invincible/ill Weaver is a Detroit based lyricist, performance artist, and activist. 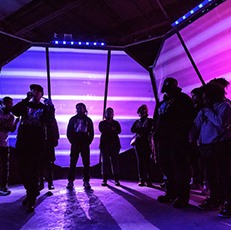 Invincible is also a member of Complex Movements, a Detroit-based artist collective supporting the transformation of communities by exploring the connections of complex science and social justice movements through multimedia interactive performance work. They spent over a decade organizing with Detroit Summer, a multi-racial, intergenerational collective in Detroit that is transforming communities through youth facilitative leadership, creativity, and collective action. Invincible co-founded the Detroit Future Youth network to support social justice and media-based youth projects throughout the city. They produce events, organize actions, design curriculum, facilitate workshops, weave participatory community media projects, and beyond, while simultaneously creating music, media, and touring internationally. As a co-founder of EMERGENCE Media, Invincible released their debut album ShapeShifters (2008) and produced award winning videos like The Revival (2009) about women in hip-hop, and Locusts (2008) resisting displacement and gentrification in Detroit. They have performed around the world for two decades, both as a solo artist, featured as part of the gender justice Hip-Hop collective ANOMOLIES, and in collaboration with Platinum Pied Pipers. They teamed up with longtime producer Waajeed in 2010 to release "Detroit Summer/Emergence”. 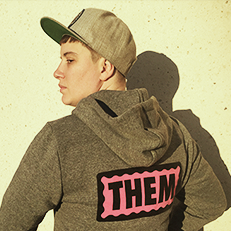 Invincible/ill is a United States Artists 2015 Fellow. They were a 2010 fellow of Kresge Arts in Detroit, and a 2009 fellow of the Ellen Stone Belic Institute for Women and Gender in the Arts and Media. Complex Movements most recent project, Beware of the Dandelions, is an interactive multimedia installation exploring the relationship between complex sciences and social justice movements through science fiction, music, projections, animation, workshops, and organizing. From 2015-2016 the group took the project on tour to Seattle, Dallas and Detroit. It has drawn critical acclaim and attention from the likes of Art in America, The Independent, Fader, and the Creators Project to name a few. The project is inspired by Grace Lee Boggs, Charity Hicks, Sheddy Rollins, and Detroit movement networks. So what comes of all this? Let's talk about what happens during and after interaction and what makes a project successful. Is 'awe' a form of activism? Complex Movements will share insights from their project Beware of the Dandelions, a mobile art installation that functions as a multimedia performance, community organizing process, and oral history video archive. Beware of the Dandelions intersects disciplines including: community organizing, design, hip-hop and electronic music, architecture, and theater. Complex Movements engages communities to expand their strategies for organizing around local and trans-local social justice issues.